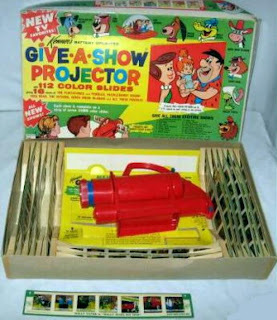 DISNEYKINS DISPLAYER - THIS WAS PURCHASED AT OUR LOCAL SEARS IN THE 1960'S, AND HUNG ON MY BROTHER'S AND MY BEDROOM WALL UNTIL I GOT MY OWN FIRST APARTMENT IN 1984. I MISSED OUT ON A LOT OF THE TOYS I'VE SHOWN HERE. 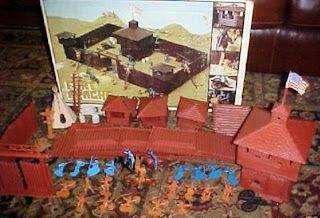 HOWEVER, ONE I DID RECEIVE THAT FOR ME WAS ONE OF 3 OF MY ULTIMATE CHRISTMAS GIFTS WAS THE MARX FT. APACHE PLAYSET. I PLAYED WITH THIS SET FOR HOUR AFTER HOUR UNTIL I "OUTGREW' IT, AND IT WAS GIVEN AWAY TO A YOUNGER COUSIN (DANGIT). Oh man, thanks for the flashback. I forgot all about these. I had one, I think it was the smaller version. I think I had a Popeye set and the Mary Poppins. Syncing up the record and the film strip was not quite as easy as the directions made it sound. Quite often the record would be telling the next part of the story while the film strip just sat there. Attempts made to force them into sync would cause the film strip mechanics to grind horribly as it was yanked into the right position, maybe. Usually so busy working out the sync we missed most of the show. And yea, the picture was no way near that clear. One side was always more focused than the other, as if it was being projected at an angle. Anyway, sorry to ramble. Going from completely forgotten about the thing to total recall so quickly has been a head spinner. Thanks for the post!! Heh. 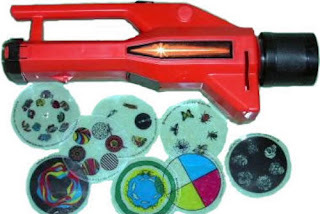 This was one of my favorite things growing up. The picture was quite crappy. It was like a smaller than 8mm image illuminated by a plain light bulb onto a magnifier like those cheap-o things people used to put in the back windows of vans. Funny you should mention this. A few weeks ago, I'd gone to work and when I came home my wife told my my folks had been by. I had no idea they were coming. Well, guess it was of vital importance for my mother to reunite me with my Snow 'n Tell because she laid it on my wife and here it sits, in the basement with me. OK, lol, I can give you a little more info. 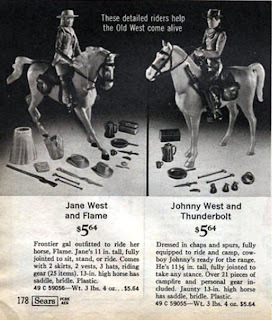 The one I have is the $27 one in that Wishbook page. Yeah, it still works. To be fair, time probably hasn't done this thing too many favors. The turntable is quite a bit wobbly, for instance. But to say the picture in the ad is simulated would be an understatement of huge proportions. 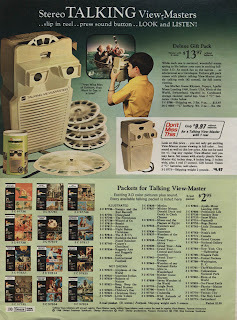 Even back in the 70s, I remember having to use this thing in a completely dark room to actually see anything. Today you have that plus the fact that the filmstrips look like Eastmancolor to me which means they're all fading out to red. I have a pretty good chunk of the library for this thing, if the back of the jackets are to be believed. 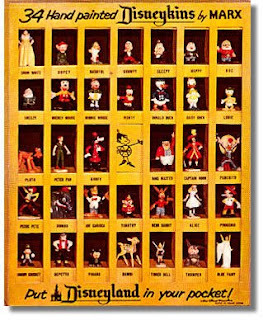 Most of them are Captain Kangaroo, then there's a bunch of Disney. Bringing up the rear are fairy tales and one lone disc about animal fossils. Glad I was able to bring back some nostaligc thoughts to your minds. I missed out on these, but have recently acquired a bunch of the record and filmstip sets. I don't suppose you'd be interested in selling yours rob G.(if it still works)? 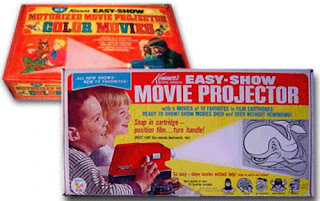 I'm trying to get my Grandkids turned on to the vintage stuff, and get them to use their imaginations a little instead of sitting in front of a DVD player for hours. 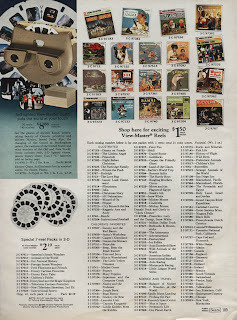 I already have them liking readlong record sets, and viewmasters. 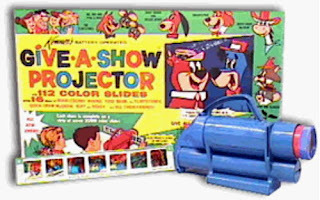 I thought next I'd work on a Show 'N Tell and maybe one of the Kenner Slide Show sets. Oops. I just now read your second comment. I'm judging from your exictement that you wouldn't be interested in selling your machine. I'll have to keep hunting for one somewhere. I'll be anxious to read your blog about it. Good luck, and have fun. My dentist had one of these! 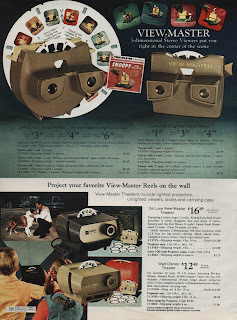 I always wanted one, of course (despite being fully aware of the less than perfect quality of the viewing experience offered by it), but never got one. The one at the dentist's office showed educational film strips (about flouride and the importance of brushing and such as that) but he'd also show more entertaining fare every once in a while. I recall seeing one with Pluto in it once. It actually did a pretty good job of getting us kids interested in something other than the torture that we were about to endure. That's cool. All our Dentists had were old magazines. Not even any comics for the kid patients. 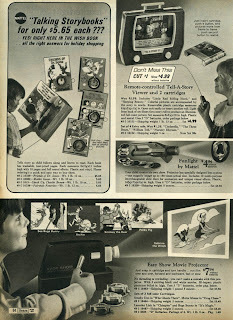 I think I've seen some of those Educational Film strips/records for sale on ebay. I wouldn't mind hearing the audio from some of the records, both A and B sides, if anybody wants to rip them and the quality is decent or if it's restorable. Me too. If I ever get any that is what I intend to do. There is one already posted here at Secret Caverns Of Readalong Treasures. That's where I found the Hulk photo at. He now also has scans of the Hulk filmstrip to watch as you listen to his record rip download. hey dave - matt here from the cavern - I have another couple of these show and tell records featuring superheroes, i'll try and get them posted soon! Cheers. That'd be great. How did you get the scans of the film strip to come out so clearly? Maybe someone can use them. I just found one of these while cleaning out my grandparents house. It looks to be in near mint condition and has tons of records with it. Cant wait to try it out ! Do you know anyone who would be interested in buying it? How much were you wanting for it? If it works perfectly well I might buy it for my other Grandkids. I wouldn't need any record sets though. I've got over 100 already. You could sell those on ebay for about $3.00 to $4.00 a piece.